Ice-Cream Shop! 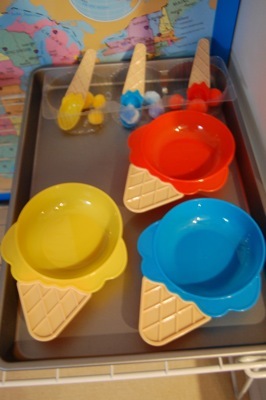 Scoop the correct color “ice-cream” into the corresponding bowl. 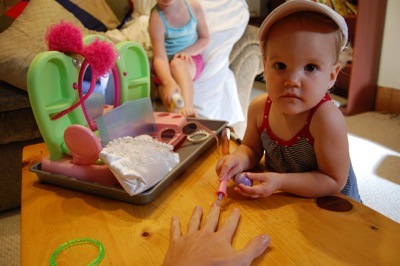 Lia loved serving Vivienne her lemon ice cream: over and over again! 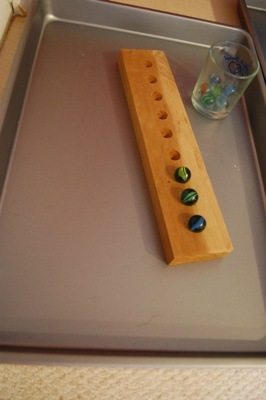 Marbles: place a marble in each groove. I tried to keep a close eye on this one… since Lia still does put tempting little nick-knacks in her mouth. I must admit that one or two marbles are missing after a week’s play. (gulp!) They haven’t shown up in a diaper yet, so my guess is that they’re in a couch cushion. Stars and Moons: Poke the stars and moons onto the sticks! 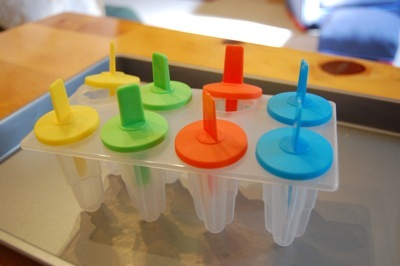 Popsicle Color Match: We’ll revisit this one over and over again. 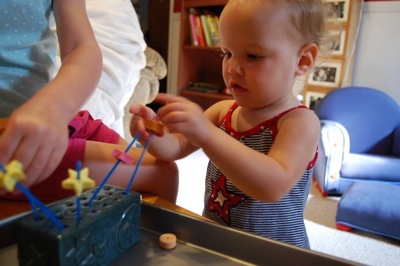 Check out more Tot Tray ideas for various ages through 1+1+1=1 Tot School!